When I first started my cushion hunt I knew I'd be trying out many before discovering my favorites. Instead of spending a boatload on super expensive cushions right off the bat, I thought I'd try my hand at some inexpensive ones first. This way I can figure out my likes/dislikes with cushions before deciding which expensive ones I want to try. Plus, I might just find some inexpensive ones I like along the way. I did some research and Innisfree cushions looked nice and fairly inexpensive, so I knew I wanted to try them. There are 3 types of Innisfree cushions: the Ampoule Intense, Long Wear, and Water Glow. I got all three to try and compare. 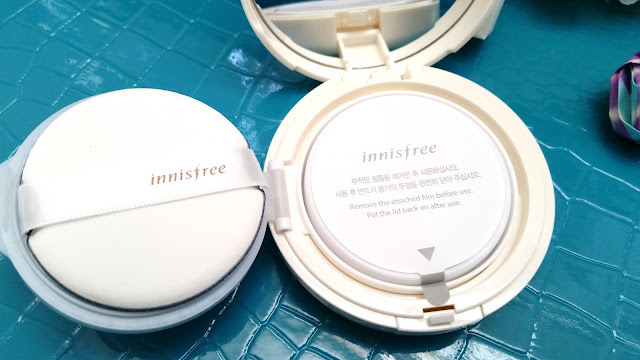 I've already reviewed the Ampoule Intense cushion, and I plan on doing a comparison of all 3 Innisfree cushions in the future. 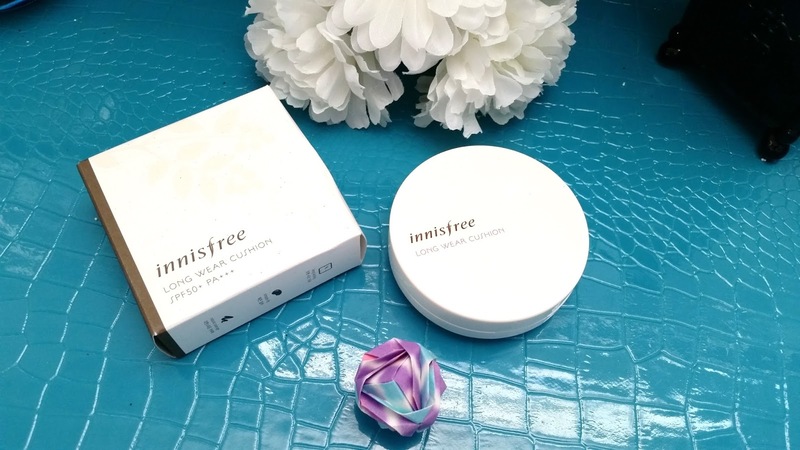 For now, let's get into today's review of the Innisfree Long Wear Cushion! Product Description: A cushion designed to be long lasting and formulated to keep the skin smooth and bright. It can help reduce discoloration, the appearance of pores, and imperfections. The cushion has good UV protection of SPF 50+ PA+++ and good sebum control as it contains Jeju volcanic powder which absorbs the sebum and keep it under control. To Use: Take the cushion puff and press it onto the cushion lightly and take an adequate amount of the product. Then pat on the face evenly. Reapply when needed. Ingredients: WATER, ZINC OXIDE (CI 77947), TITANIUM DIOXIDE (CI 77891), ETHYLHEXYL METHOXYCINNAMATE, CYCLOPENTASILOXANE, DIMETHICONE, BUTYLENE GLYCOL, PEG-10 DIMETHICONE, BUTYLENE GLYCOL DICAPRYLATE/DICAPRATE, TRISILOXANE, HDI/TRIMETHYLOL HEXYLLACTONE CROSSPOLYMER, METHYL METHACRYLATE CROSSPOLYMER, NIACINAMIDE, LAURYL PEG-8 DIMETHICONE, CYCLOHEXASILOXANE, POLYPROPYLSILSESQUIOXANE, IRON OXIDES (CI 77492), CITRUS UNSHIU PEEL EXTRACT, GLYCERIN, ORCHID EXTRACT, CAMELLIA SINENSIS LEAF EXTRACT, CAMELLIA JAPONICA LEAF EXTRACT, DIMETHICONE/VINYL DIMETHICONE CROSSPOLYMER, DISODIUM EDTA, DISTEARDIMONIUM HECTORITE, LECITHIN, MICROCRYSTALLINE CELLULOSE, MANNITOL, MINERAL SALTS, OPUNTIA COCCINELLIFERA FRUIT EXTRACT, CITRUS AURANTIUM BERGAMIA (BERGAMOT) FRUIT EXTRACT, BORON NITRIDE, VINYL DIMETHICONE/METHICONE SILSESQUIOXANE CROSSPOLYMER, SODIUM CHLORIDE, STEARIC ACID, SILICA, ORYZA SATIVA (RICE) POWDER, ADENOSINE, ACRYLATES/ETHYLHEXYL ACRYLATE/DIMETHICONE METHACRYLATE COPOLYMER, ALUMINUM HYDROXIDE, ETHYLHEXYLGLYCERIN, ETHYLHEXYL PALMITATE, CITRUS AURANTIUM DULCIS (ORANGE) FRUIT EXTRACT, ZEA MAYS (CORN) STARCH, ISOSTEARIC ACID, ISOPROPYL PALMITATE, CITRUS PARADISI (GRAPEFRUIT) FRUIT EXTRACT, CAPRYLYL GLYCOL, CITRUS TANGERINA (TANGERINE) EXTRACT, TRIETHOXYCAPRYLYLSILANE, PHENYL TRIMETHICONE, POLYGLYCERYL-3 POLYRICINOLEATE, POLYVINYL ALCOHOL, POLYHYDROXYSTEARIC ACID, PROPANEDIOL, VOLCANIC ASH, IRON OXIDES (CI 77491), IRON OXIDES (CI 77499), FRAGRANCE. 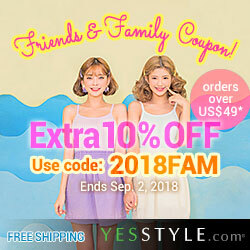 Scent: Like most Innisfree products, this cushion has that distinctive Innisfree scent. For me the scent is light herbal with hints of green tea and floral notes. Exactly like the Ampoule Intense cushion. The scent is not overwhelming and it lightens quickly. Color: The Long Wear cushion has the most colors compared to all the other cushions. They recently expanded their color range as well. The color range is still not broad enough to cover all skin tones though. The color I have here is #23 True Beige. There's also #11 Ivory, #13 Light Beige, #21 Natural Beige, #31 Sand Beige, and #33 Deep Beige. The color I had for the Ampoule Intense cushion is #21, so you can look at that for color reference if you'd like. 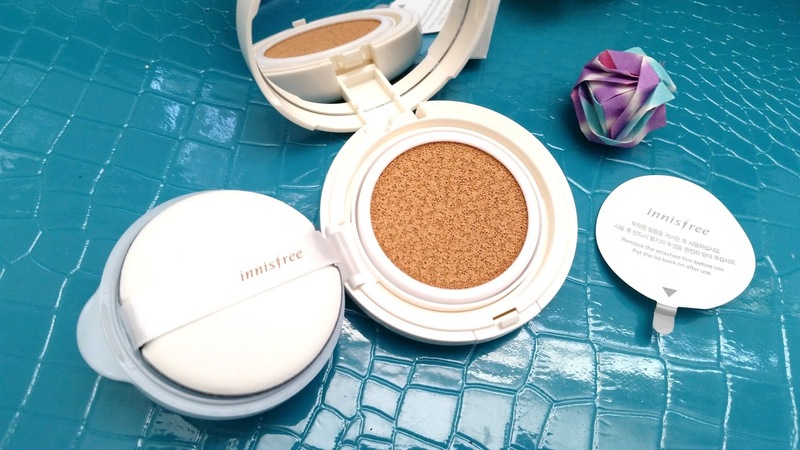 I find that Innisfree's cushion colors are generally a tiny bit lighter than other cushion. Texture: Cushions generally have a fine liquid like texture which is why it feels weightless and it's easy to apply. Innisfree cushions have that liquidy texture. I find that the Long Wear cushion have more coverage while the Ampoule Intense one is more moisturizing and feels lighter. My Thoughts: I knew I'd want a darker shade for the Long Wear cushion since I was going to use it in the summer times. (I tend to tan a bit even with all the sunscreen I use). The #21 shade was just a tad lighter for my skin, even for the winter times, so I knew it would be a no-no for summer times (no need to look like a ghost). The #23 shade was a better match. Still a bit light for the summer time but it looked petty natural. Anyways, I had high hopes for this Innisfree Long Wear Cushion because I really enjoyed the Ampoule Intense cushion and thought it would be similar, just with a matte finish. When I first tried it on, the formula felt similar to the Ampoule Intense cushion but not the same. The Long Wear cushion is bit thicker, covers a little better, and has a matte finish instead of dewy. I was pretty happy with the look, until 6 hours later. I use primers on and off and usually when I first try a new cushion or BB cream or foundation, I don't use any primers. This way I can gauge the product's effectiveness without the help of any other product. Plus, I can also find out which products I can use with it to help it achieve a better state. So what happened when I tried the Long Wear cushion and didn't use any primers? An oily pore accentuated mess happened, that's what. It was a sight that I have never seen with any other cushion/foundation/BB/CC creams I've ever used. Although, in retrospect, I never really used any cushion/foundation/BB/CC creams with a matte finish before, so I didn't know this could happen. So what happened? Well, as someone with combo to oily skin, I know my T-zone area and cheek areas get oily the most in the summer times while the rest of the face is more combo. I knew I'd need to blot off some oil or use sebum control powder mid day. However, what came face to face with me when I checked my mirror after 6 hours was a sight to (not) be seen. After 6 hours of wearing the Long Wear cushion my T-zone and cheeks looked like a mess. 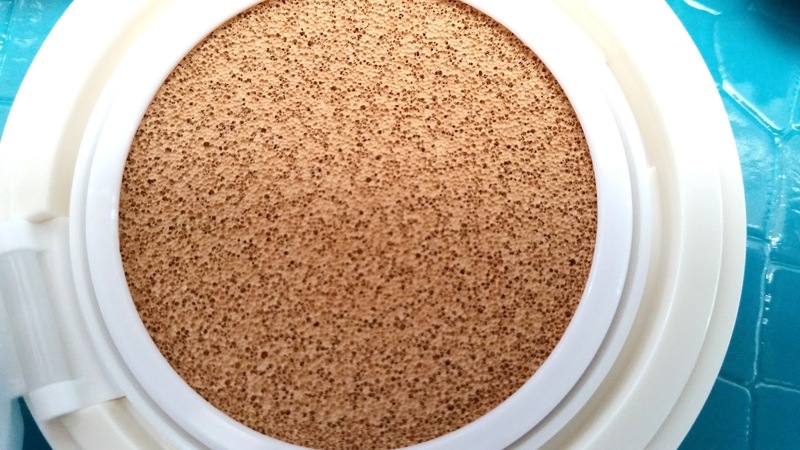 The pores were accentuated, it started to look patchy, and the sebum has pushed its way through the cushion product. Each pore just looked like a mini oil well with cushion product surrounding it. Ew, I know, but this is the best way to explain it. I was not happy. Good thing I was testing it at home though. Can you imagine wearing that out and not knowing? To make matters worse? There's no way to reverse this effect. 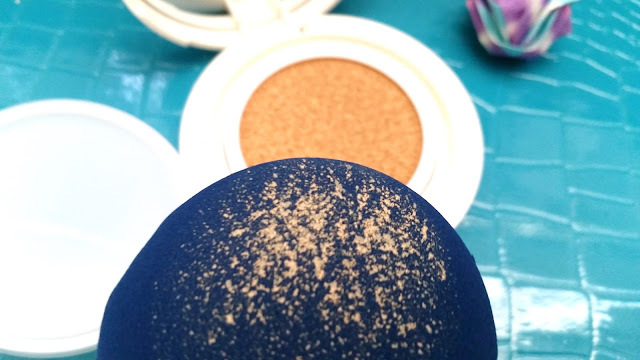 You can't just pat on some more Long Wear cushion to fix the patchy, accentuated, and sebum filled look. Sebum control powders and blotting papers don't help either and don't even think about trying mists (I tried). The only way was to remove the base makeup and start over. Would you believe that when I retried for a second time without primer, I achieved the same flawless look that I had the first time I tried the cushion on full force. Then, 6 hours later, it became an oily mess again. I thought this was odd at first because I use cushion products all the time (although not matte finish ones) and they never create such effects. Even if my face does get oily 6 hours into the day, a little blotting or a bit of sebum control powder will do the trick. Actually, I usually use a bit of sebum control powder in the mornings when I use my other cushion products. That can help mattify the look a bit and last me well over 6 hours before I need to add a little bit more powder. However, none of them created any issues to the point that the only way to fix the makeup was to remove it whole. At that point, I thought I had a devil cushion on my hand. I had read before that people who try Innisfree's Long Wear Cushions either love them or hate them. I thought I was going to be one of those people who would love the cushion but now that I have it in my hands I was becoming doubtful. 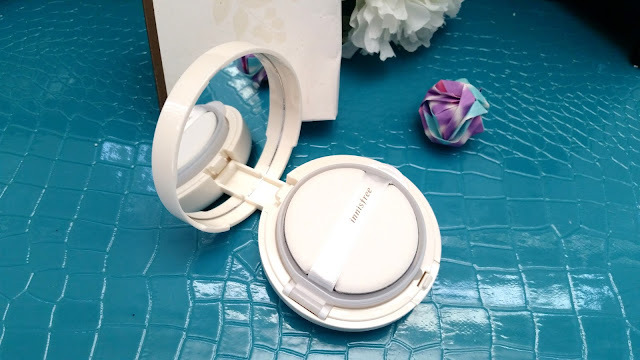 I did try putting on some sebum control powder after I apply the Long Wear cushion. Unfortunately, the results after 6 hours was the same. I wondered if it's the formula of the cushion and it just doesn't work well with my oily T-Zone and cheeks. 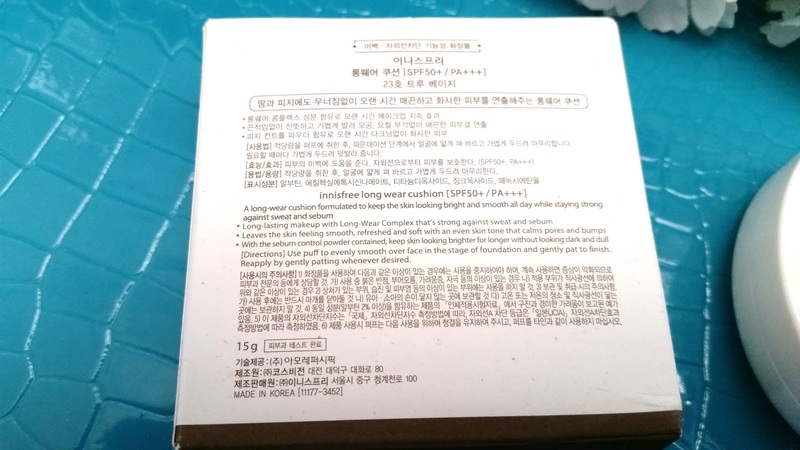 Funnily enough, Innisfree's product description said that their "sebum control Jeju volcanic powder will intuitively adjust to meet and address your skin concerns for makeup that wears better, longer, and truer." However, it did not meet my needs or wear better, last longer or truer. So it kind of over exaggerated its product claims. I was disappointed with the issue the Long Wear cushion presented me. However, before I throw in the towel and give up on it, I needed to try it with some primers. Maybe the cushion couldn't control all my sebum and a primer is all I need to help the cushion perform better. So, I decided then and there that I would try out all my primers with the cushion to see if any of them can help fix the issue and control excess sebum. 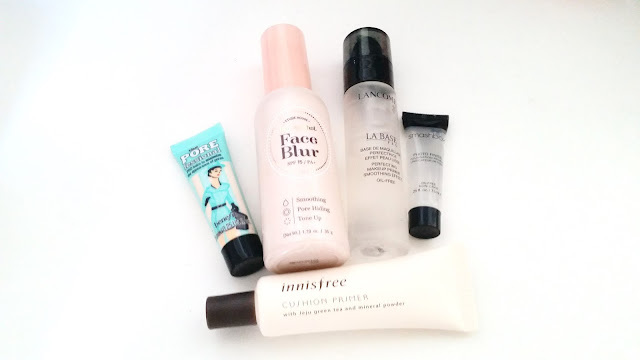 The first primer I tested was the Etude House Beauty Shot Face Blur. The Beauty shot doesn't really have sebum control for me and the only reason I tried it was because I wanted to make sure sebum was a cause of the issue. After 6 hours, the same pore accentuated, patchy and sebum filled look was there waiting for me, although not as awful as when I didn't use a primer. The next primer I tried with the Long Wear cushion was the Smashbox primer. I've only got a deluxe sample of the Smashbox primer and I was never a fan of it so I hardly used it. It doesn't work with most of my base products, but I decided to try it anyways just in case. The result? Nope, didn't help at all. After Smashbox, I decided to try my Lancome La Base Pro. I like my Lancome primer with my foundations, although I've never tried it with any of my BB creams/cushions so I didn't know how it would go. Unfortunately, its results was similar to the Face Blur. Finally, my last pore related primer on hand is the Innisfree cushion primer. Like the Porefessional, it was able to prevent that unfixable oily mess, however, it still wasn't too great at controlling sebum. The Long Wear cushion makeup still needed touch-ups after 5 hours, however, touching up with the cushion can turn out a bit patchy and cakey. I have to be honest, I was hoping a primer would fix the issue completely. However, that doesn't seem to be the result. I am quite disappointed that this cushion didn't work for me. A lot of people recommend this as a great cushion for those with combo to oily skin types. However, as someone with combo to oily skin, I didn't have any luck with it. *Earlier, when I talked about the Porefessional primer I mentioned at the end that there was another cause to the issue. That cause is sweat. It's inevitable to sweat a little in the hot summer heat and it didn't occur to me early in the testing period that sweat could be the other cause to the issue. That is, until I remembered something about the day I first tried the cushion full on. I remember that it was a particularly hot day when I first tried the Long Wear cushion. That day, I was playing with Momo in the backyard which caused me to sweat. So, I wondered if sweat is another factor. With the Porefessional Primer + Long Wear cushion, I put this thought to the test and got the 'aha' moment I was looking for. Cushion applied on the right side and not on the left. Final Thoughts: I'm pretty disappointed by this cushion. It was my first matte cushion and it didn't turn out well. Now, it makes me wonder if all the other matte cushions are like this. I hope not. When I first applied the cushion, that pretty matte finish looked flawless. I wish it would have stayed like that and not turn into a mess after 6 hours or so. A good primer can help fix the issue a bit, however, the Long wear cushion is still not long lasting (like it promises) and touch-ups during the day will be needed. Would I repurchase this cushion? Nope. I think I can find better cushions for my skin type. Do I think this cushion is worth a try? Um, maybe. Just not for those with similar skin type as me. I know I didn't have a great experience with it, however, people who have different skin types might have better luck. 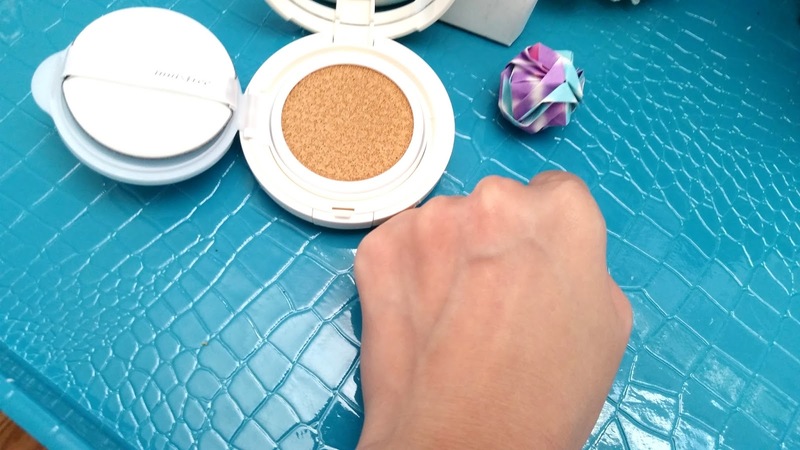 The cushion's medium coverage was nice and that mattifying finish at first created a perfect look. So those without oily skin might not get that oily mess. I think if you want to get this cushion, it's best to try it at a beauty store first to see how the formula works on your skin. 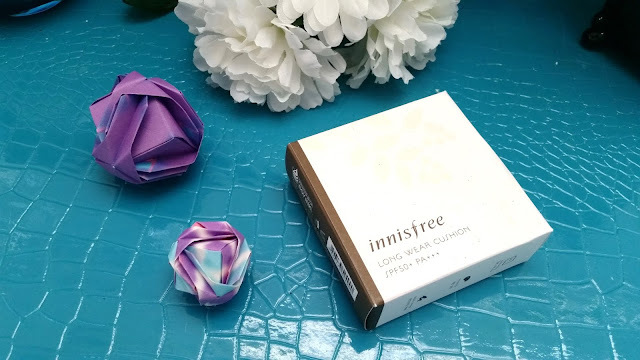 I would love to hear your thoughts on this Innisfree Long Wear Cushion and whether it works for you or not. Leave a comment below and let me know! Disclosure: All the opinions in this post are honest and my own. This product was purchased by me with my own money.